Instant BFF or Gotta Earn Her Trust: You have SO got to earn her trust—and you’re going to have to work hard to do it. Friends or Family: She’s all about her girlfriends—sisterhood unite! Shower or Bath: Bath, with her mobile and a glass of wine in easy reach. What she doesn't want the hero to know: That despite his horrific reputation and how gallingly confident he is, she so WANTS him! We'd be her friend because... Nadia is full of passion and energy and totally wants to do the right thing, she’s fully supportive of her girlfriends—mates before dates all the way!!! His lips brushed hers lightly, just once. But the second she went to snap back at him he did it again. Then again and again and again. Until it was lots—as he’d said. Not deep, hungry kisses, but slivers of rich sensuality that made her open her mouth for more before she’d thought to stop it. Then she couldn’t think at all—she only wanted to move closer for more. But he kept them light, lifting back as she tilted towards him. With one hand he played her like an instrument, gliding one finger after the other across her neck. Not making music but pleasure, with gentle touches. But she knew the strength was there. Dating and Other Dangers is part of the RIVA launch in the UK and is available as an ebook from AmazonUK. Here’s the blurb for the new look Riva! Could two players both win the dating game? Nadia Keenan is corporate HR by day, web-dating warrior by night – she runs WomanBwarned.com, where bad-date stories are aired and shared to help other women avoid the same pitfalls. Ethan Rush, serial dater-and-dumper and utterly, gorgeously lush, has just found out he’s been trashed – repeatedly – on Nadia’s website and he’s…um…not happy. Both know they’re in the right. Neither is ready to back down. Let the battle of the dates begin! It is also on the shelves in stores in North America this month as a Presents Extra and you can grab it online from Amazon and Barnes & Noble. 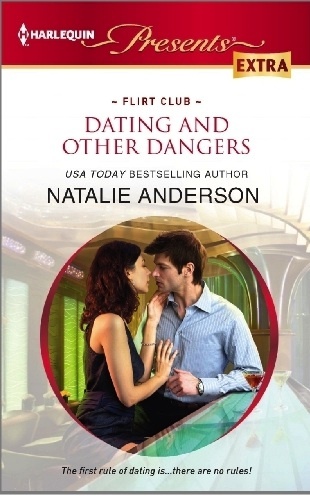 After being trashed on Nadia’s website, serial dater-and-dumper Ethan Rush is about to put Nadia’s rules to the test. He’s determined to change her mind about him. She’s determined to prove him for the cad he is. Buy DATING & OTHER DANGERS from Mills and Boon UK! Through September and October, keep dropping by Natalie's blog for giveaways, sneak peeks at more great stories and the low down on RIVA's hottest heroes.